Let’s carry the analogy of a luxury car with our Translator Professional a step further. We said that our Text Translator was similar to a luxury car because it has the equivalent of a steering wheel, brakes, comfortable seats, accessories, GPS and Auto Pilot. Let’s draw some basic conclusions. If your “free” translation engine can run only straight ahead because it has no Interactive functionality (no steering wheel), then a GPS (True Retranslation System) would then be useless. The good thing about a GPS is that it lets you know where you have to make a turn. But, how can you make a turn if your “engine” does not have a steering wheel? On the other hand, suppose you eventually install a steering wheel in your vehicle, what’s the good of it if you are driving blindfolded? You don’t know what the Spanish translation is saying, so how can you correct it or how can you improve it? What does this mean? The Spanish User would be confused with this result, or perhaps he would accept it tacitly and send it off to his recipient without the slightest idea of what his translator is saying in English. 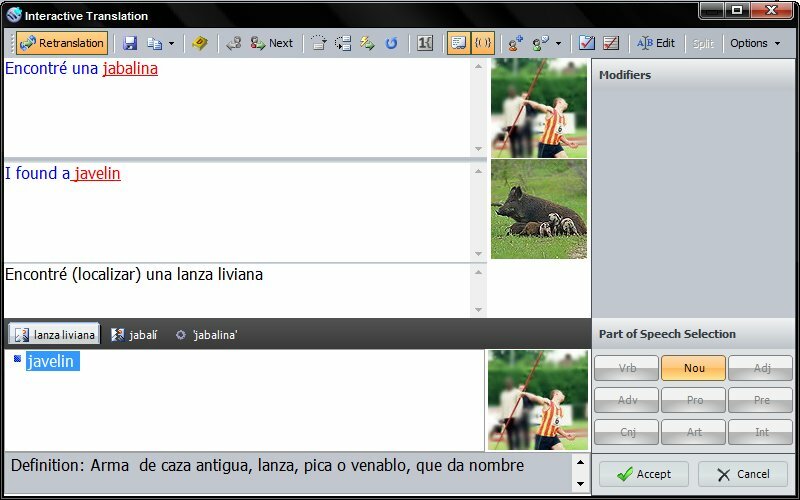 On the other hand, the English-speaking User would also be confused, because “javelins” are sport objects; one does not “meet” them. 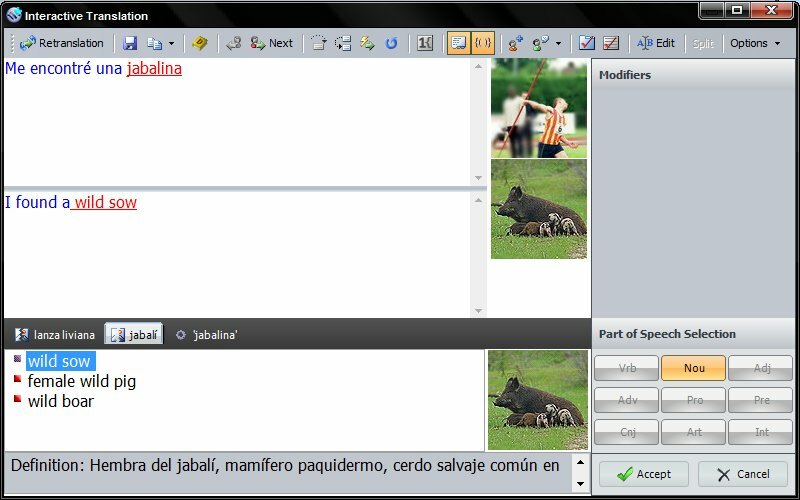 The English-speaking User might even think “jabalina” is a kind of personage and that it has a mysterious equivalent in English called “javelin”. Problem Number One: No one knows what the translation means. Problem Number Two: The User cannot change the result, even if he knew what the translation is saying. Let’s see how Word Magic Professional Text Translator handles this sentence. Encontré una jabalina=I found a javelin=Encontré (localizar) una lanza liviana.